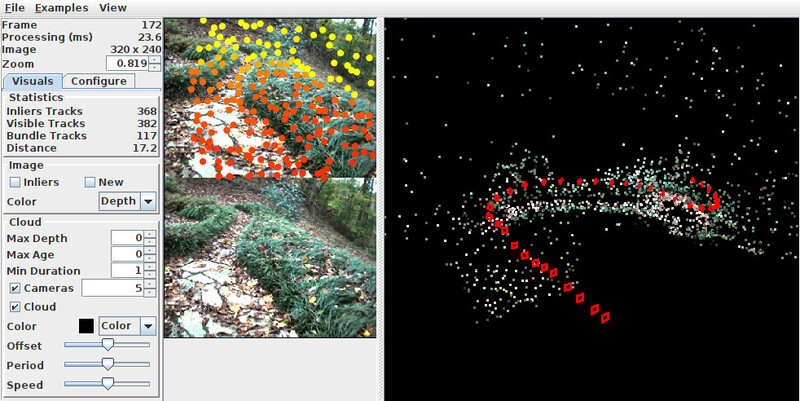 Screenshot from visual odometry demonstration. Example just outputs estimated location. Stereo visual odometry estimates the camera's egomotion using a pair of calibrated cameras. Stereo camera systems are inherently more stable than monocular ones because the stereo pair provides good triangulation of image features and resolves the scale ambiguity. The example below shows how to use a high level interface with visual odometry algorithms. The basic high level interface hides internal data structures which are useful in many applications, which is why an optional interface is provided for accessing some of those structures. * information on the scene can be optionally extracted from the algorithm if it implements AccessPointTracks3D. // Pass in intrinsic/extrinsic calibration. This can be changed in the future. * and return a string. This page was last edited on 26 December 2018, at 21:04.